Do you see gear oil leaking from the rear wheel? Is your vehicle making a roaring sound that follows the vehicle speed from the rear? 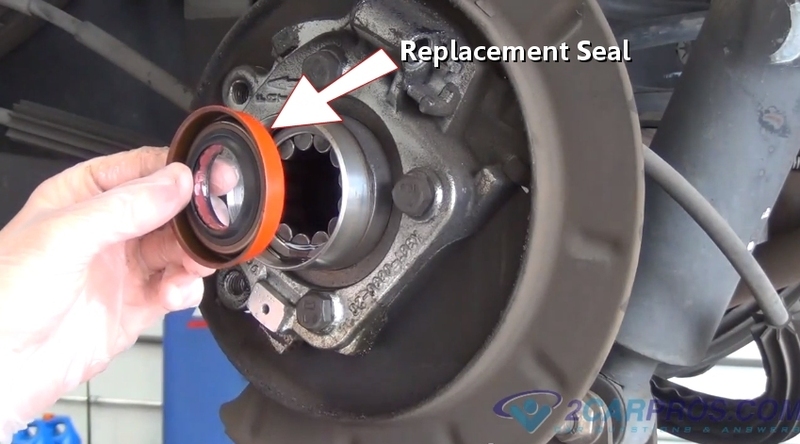 Do you wonder how difficult it is to change the front or rear axle seal and bearing or bearing hub? You have come to the right place. We are a team of ASE certified online mechanics that have created this guide for you to save you money while having the satisfaction of doing the job right. If you are not going to do the repair yourself this guide with video will show you what you are paying for when you take your vehicle into a repair shop. 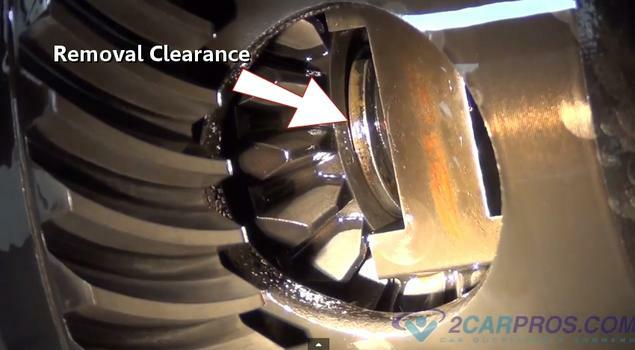 Identify the side of the differential you see the leak or hear the noise on before performing the repair. In this repair you will be dealing with gear oil so have a fluid catch basin ready. Also, if the gear oil has been leaking for a while you will need to replace the emergency brake shoes. Once the vehicle is safely in the air and on jack stands its time to get under the rear of it and remove the rear differential cover. Begin by loosening the bottom three bolts, this will hold the cover in place while removing the remainder of the bolts. Have a fluid catch basin ready to collect the gear oil which should start to flow out from the cover. 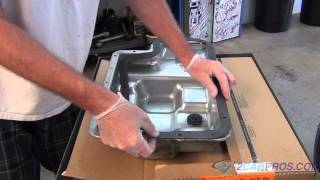 Remove the remainder of the cover bolts and store them in a plastic container so they don't get lost. 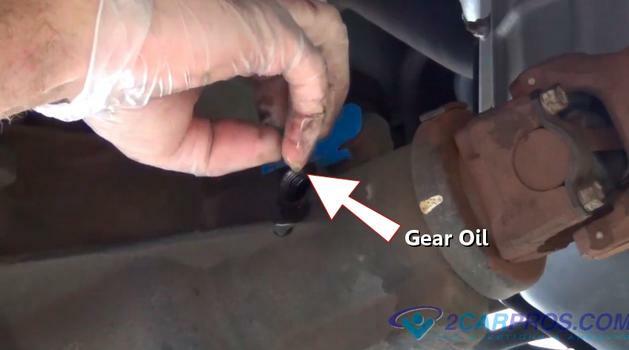 If gear oil doesn't start to leak you should help break the seal loose by using a flat blade (standard) screwdriver and allow the gear oil to drain out. 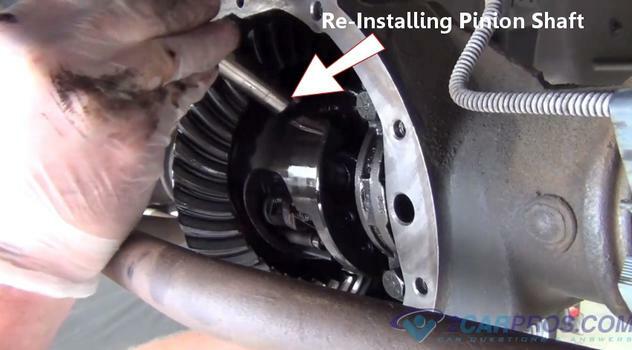 Once most of the gear oil has drained into the catch basin, remove the remaining three bolts to remove the cover. 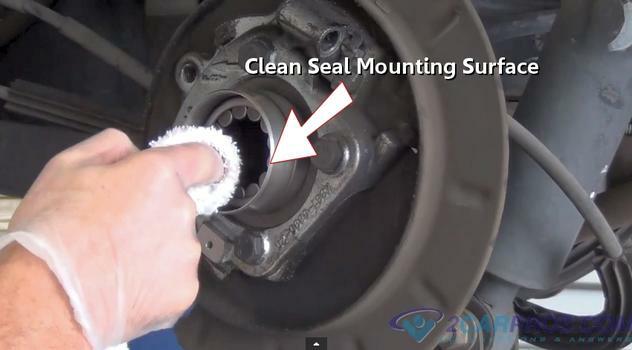 Use a large screw driver to continue releasing the seal. Continue to remove the cover and place it off to the side. This cover will need to be cleaned which will be done in later steps. 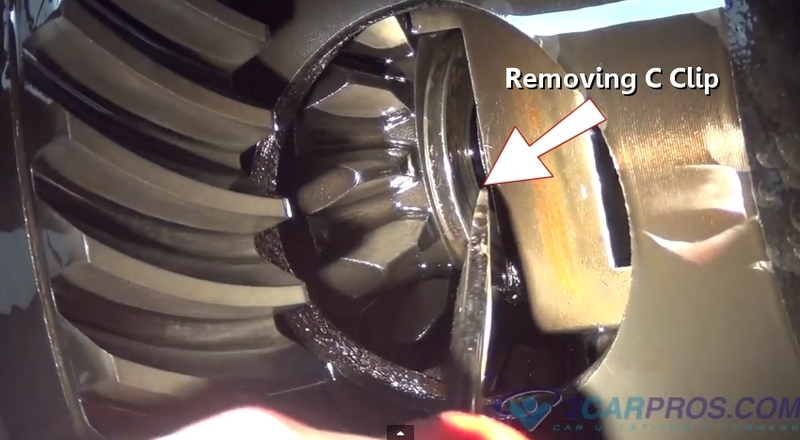 Once the cover is removed it will expose the inner workings of the differential. After inspecting the inner workings and while the transmission is in natural, rotate the driveshaft until the carrier pivot shaft bolt is exposed. 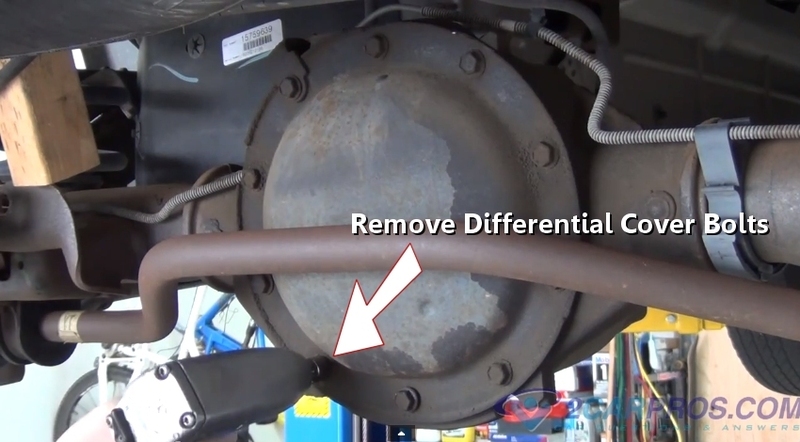 This can take a few turns of the driveshaft before seeing it. Stop turning when the bolt is near the top of housing. Also, keep your fingers clear while rotating the gear set to avoid injury, these gears can be sharp. 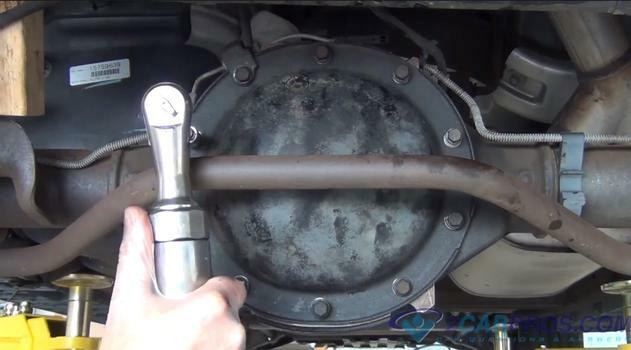 Once the carrier bolt has been located, use a small ratchet or wrench (8mm) to loosen and remove the bolt. This bolt can be snug so make sure your tool is squarely on the head of the bolt to avoid rounding which will make the job much more difficult. If the bolt breaks inside the carrier use an air hammer which can be used to force outward (break downward) the pivot rod through the carrier. The pivot pin will need to be replaced along with the bolt. Once the pivot bolt has been removed, reach your hand down around to the bottom of the carrier and use your finger to pop the pin upward while grabbing it with your other hand. 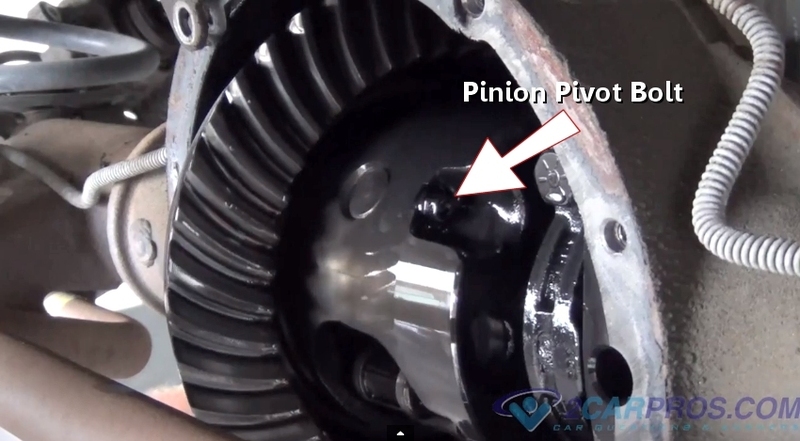 You might need to maneuver the driveshaft to gain enough clearance to allow the pinion pivot to slide completely out. After the pinion pin has been removed, again rotate the driveshaft until the "C" clip access port appears. 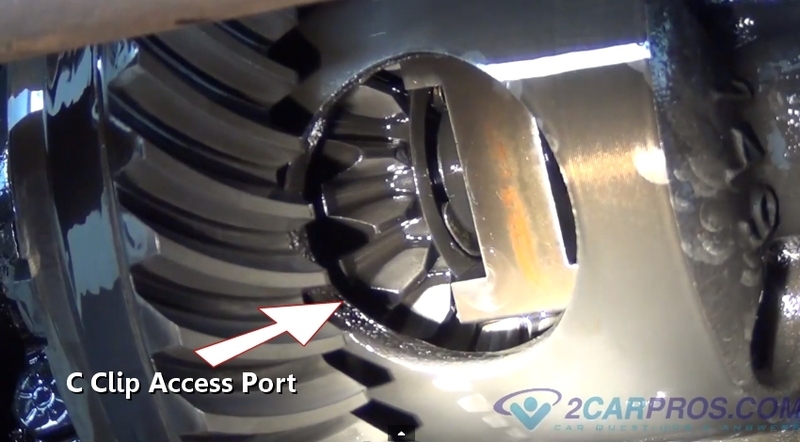 Watch the unit as you slowly turn it, if the spider gears (small gears) start to move into the port then turn the axle with the driveshaft to keep the gears in their position. 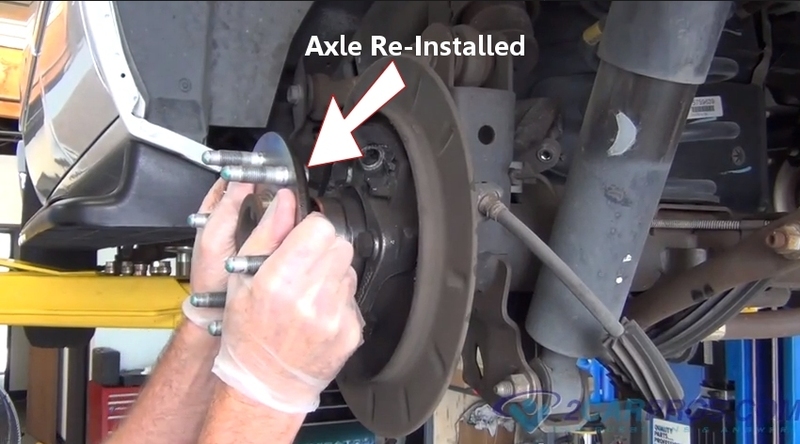 Next, at the axle flange (wheel side) push the axle inward toward the differential, the axle will move inward slightly. This is to allow enough clearance for the "C" clip to be removed which holds the axle into the differential. Using a small screwdriver or magnet work the metal "C" clip in a circular motion, This will enable you to remove the clip which will release the axle from the differential. This can take a little time so hang in there. Once the C clip has been removed from the carrier check the clip for wear and scoring and replace if needed. This will be a dealer part. 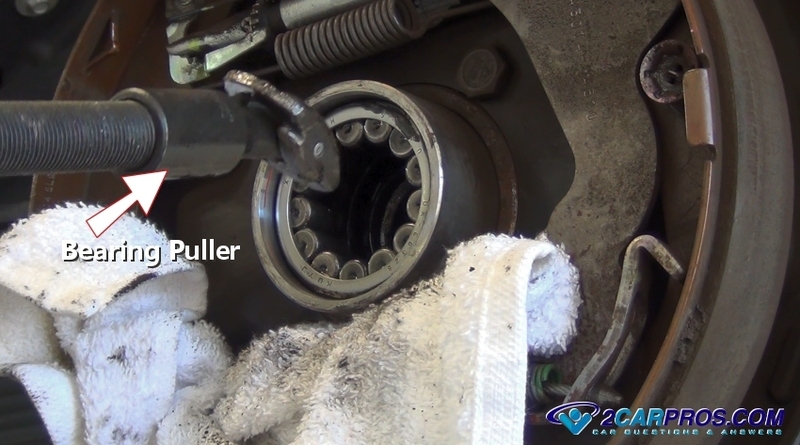 Now that the C clip has been removed grasp the axle at the flange and pull outward, the axle should slide out completely from the differential housing, use a shop towel around the axle as it's being removed to wipe residual gear oil to keep the mess down to a minimum. 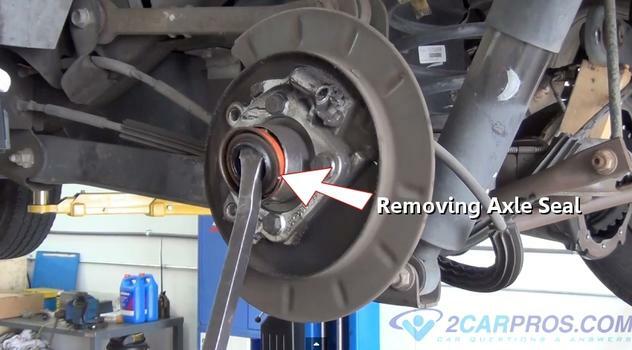 In this picture the parking brake shoes have been removed for replacement but if the shoes are okay you can leave them installed while replacing the bearing and seal. 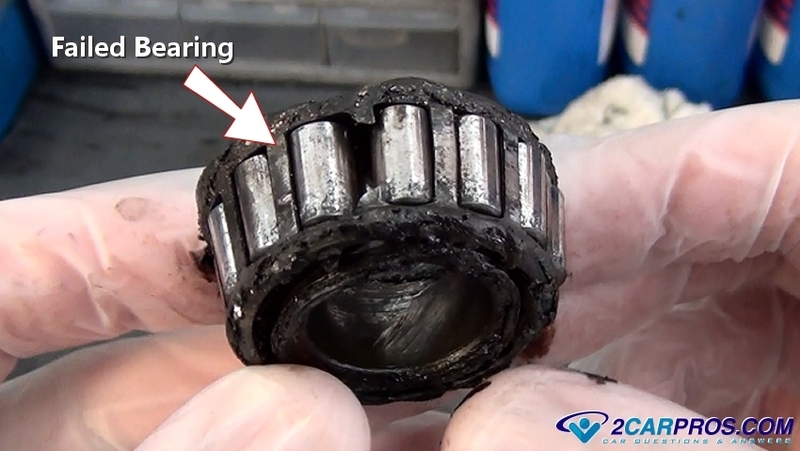 After the axle has been removed inspect the bearing and seal surface to check for wear and scoring and replace if damaged. If this axle is worn you will see an obvious groove in this area. Do not reuse the axle at this point because the new seal and bearing will fail prematurely. These axles are available at the dealer for about $200.00 bucks. Now we are ready to remove the seal. 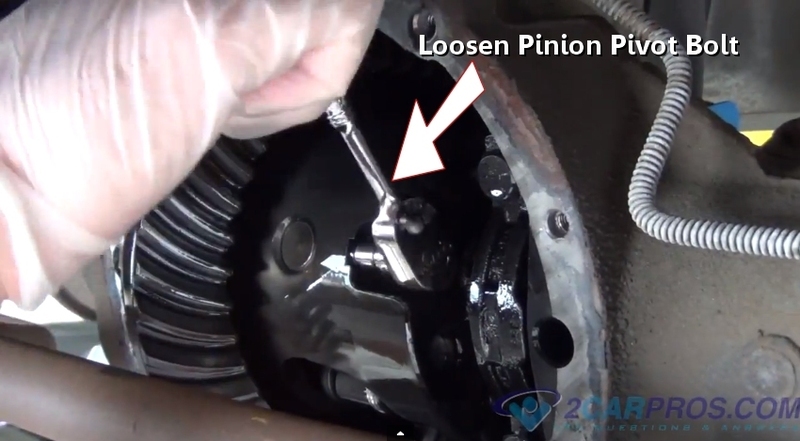 Use a large pry bar to leverage the seal out of the differential housing, you can also use a seal puller but we have found this method works pretty good. 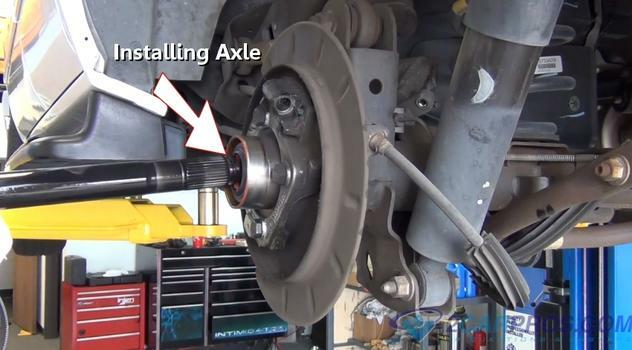 Use an axle puller to remove the axle bearing, once installed push the shoe of the puller straight which will help it lock behind the bearing. Then, thrust the anvil outward to start the pulling action, this will take several thrusts to remove the bearing. After the bearing has been removed, use a shop towel to wipe the housing clean from oil and dirt. Also check the housing for obvious scoring which can make the new seal leak. 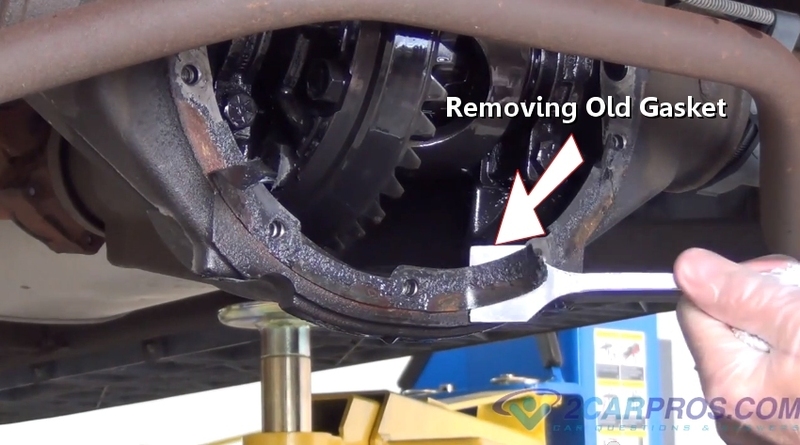 If a grove or scoring is present you will need to install the seal using silicone rubber and allow it to fully dry before refilling the differential, preferably overnight. After the bearing has been successfully removed match the old bearing to the new unit they should be an identical match. This is a bearing installation tool. Match the size of the tool to be just slightly smaller in size than the bearing. If the tool is larger or the same size it can get stuck inside the housing which will create a problem. 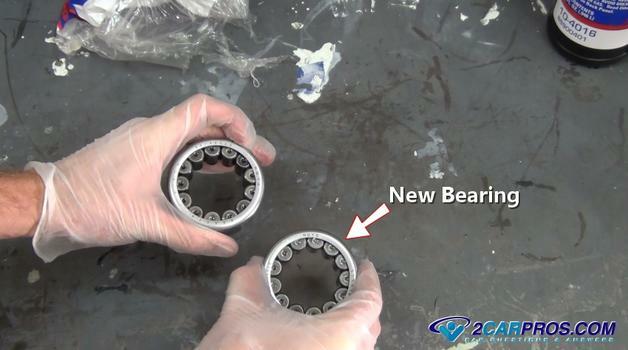 You can use a large punch and work around the bearing to install it, but using the tool is the preferred method. 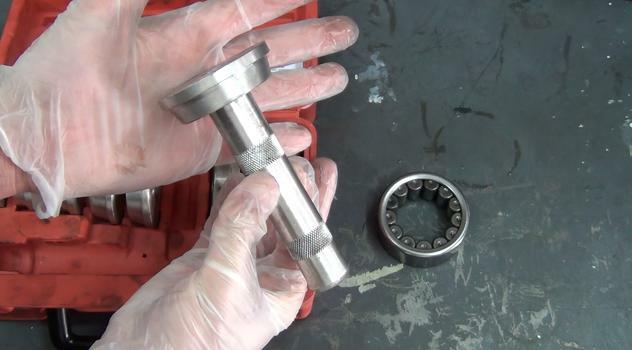 Set the new bearing squarely into the differential housing, then use the tool to install the bearing using a hammer. 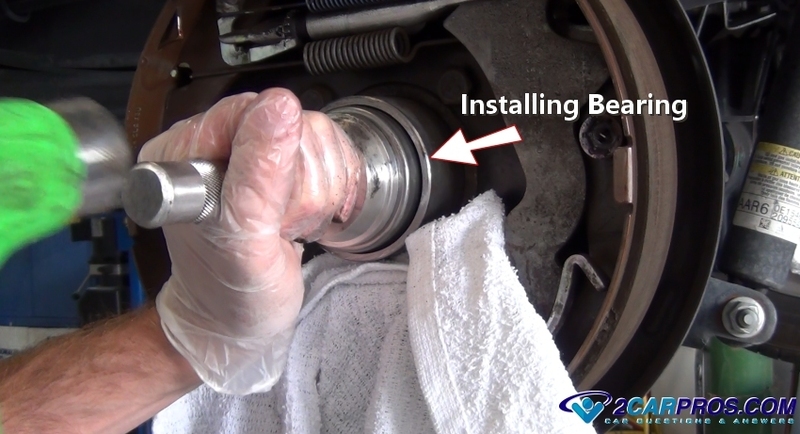 Once the bearing is fully installed the hammer will have a hard clunk sound and the bearing will not move inward. This is signaling the bearing is completely against the house shoulder. Once the bearing has been installed the seal is next. 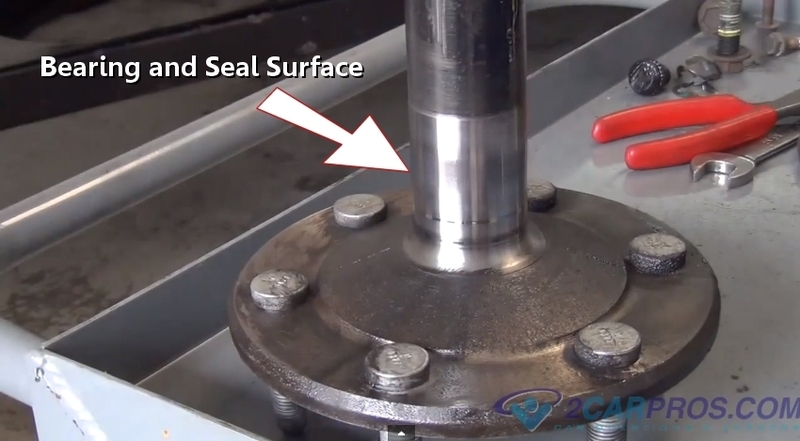 Inspect the seal surface for grooves or scores. Use a shop towel to clean the seal mounting surface which will ensure the proper installation. Use carburetor cleaner to make sure the surface is clean and dry before you begin reinstalling the seal. Next, the new seal must be installed, match up the new seal to the old one. These seals have a outer lip so the seal can only be installed one way. 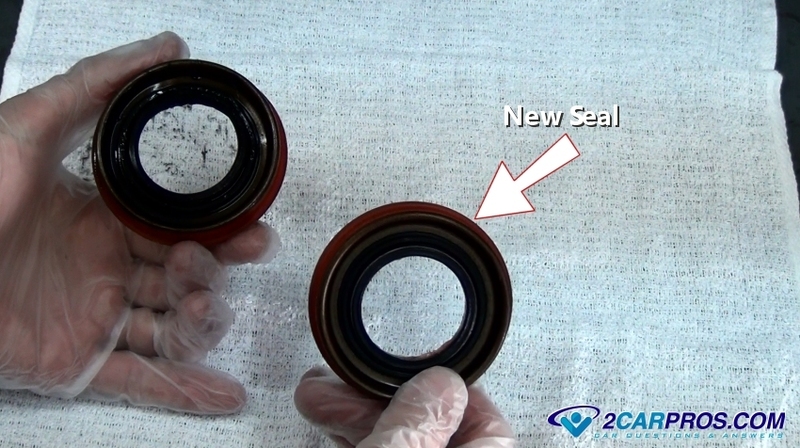 The seals should look identical unless they have been updated by the manufacturer. Once the surface has been cleaned, match the new seal to the old unit and apply sealer to the differential housing if needed. Most seals have a sealer allied to them as a thin coating, this seal uses an orange colored sealer. 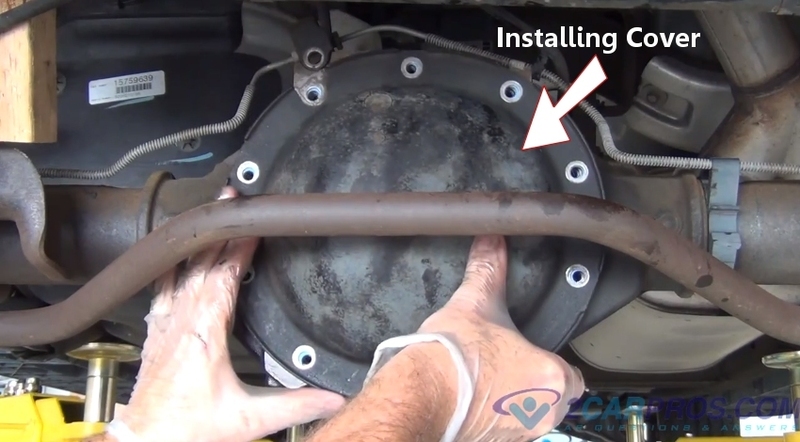 Next, you can use the seal installer which is one and the same to the bearing installer but we thought we would show you how we did it in the old days in this example. 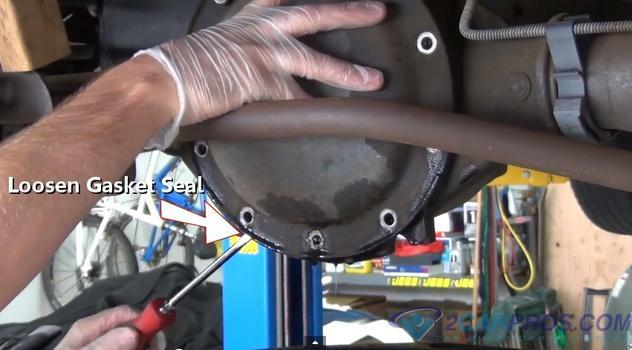 Set and hold the seal in place, then drive the seal into the differential housing using a flat bar to hammer against while installing the seal. Continue this operation until completely installed and flush against the housing and seal lip. After inspecting the axle for damage and you see that it's okay to reinstall, apply a small amount of gear oil to the bearing and seal. This will help lubricate the surfaces and give you a better chance for the new seal not to leak. Then carefully install the axle by holding it up not allowing the weight of the axle to ride against the seal lip which will damage it. While the axle is sliding inward you will need to push down on the bottom of the flange while pulling outward at the top. This will lift the end of the axle up and into the carrier. 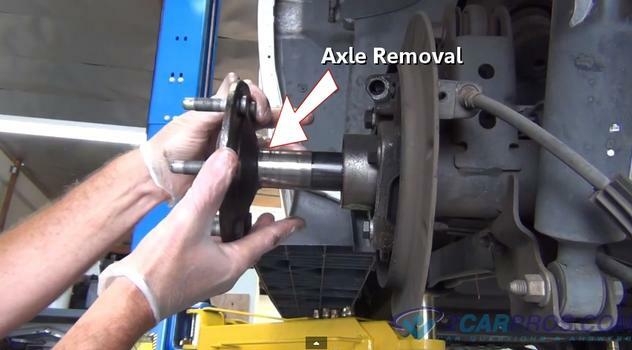 Also, turn the axle slightly at the same time, this will allow the axle spline to engage into the carrier. Then continue to push the axle inward until it stops. 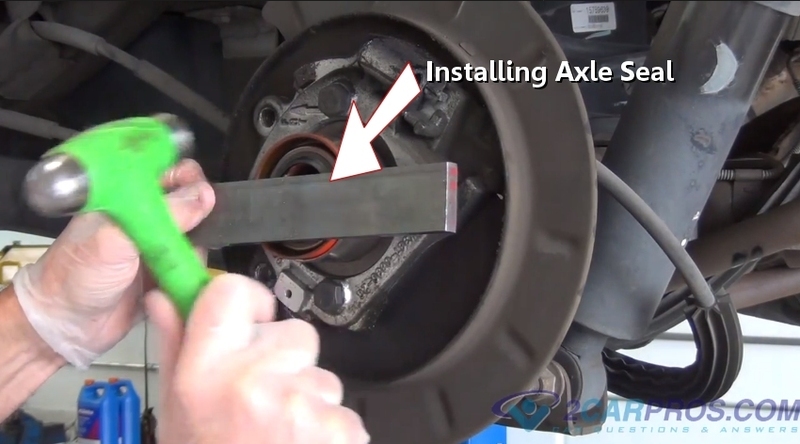 Next, check to see if the axle has been fully engaged into the carrier enough to put the clip into place. Now, reinsert the C clip retainer onto the axle through the access port, you can use a small pair of needle noise pliers if needed. After the C clip installation is complete, pull the axle outward to lock the C clip in place. 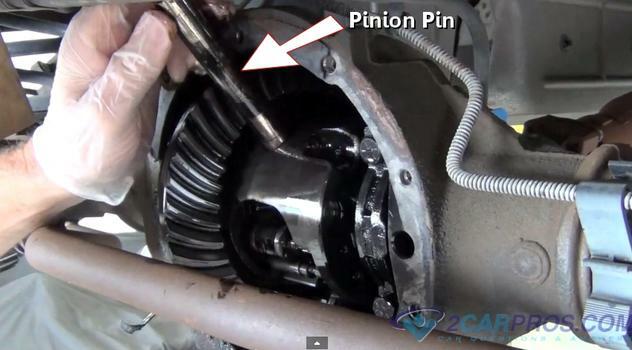 Then insert the pinion shaft, you might need to rotate the axle to align the spider gears for the shaft to be installed. Take note of the shaft bolt hole so you can reinstall the bolt. Example of bolt hole orientation before the final installation. 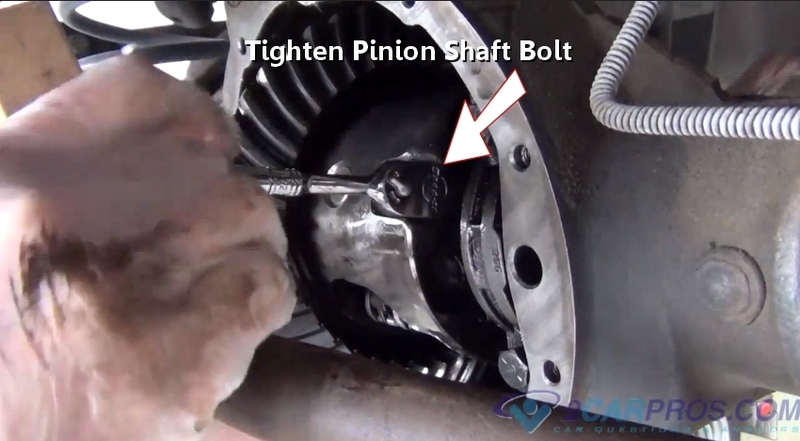 After the shaft has been installed, insert the retainer bolt and tighten, this bolt needs to be fairly snug. 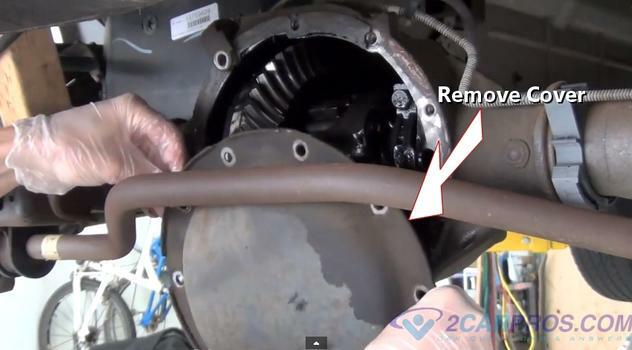 After the axle has been reinstalled use a gasket scraper to remove the old gasket and clean the differential surface. Make sure this surface is clean from gear oil or it will contaminate the sealer and possibly cause a leak. 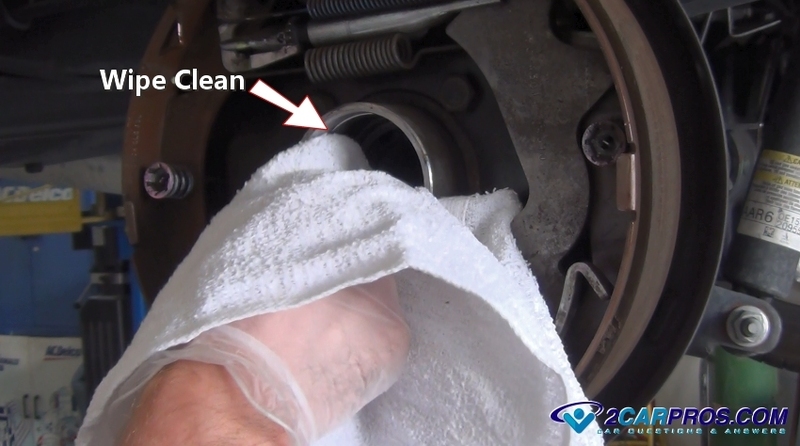 Use a shop towel to wipe out the inner differential housing to help control additional oil. 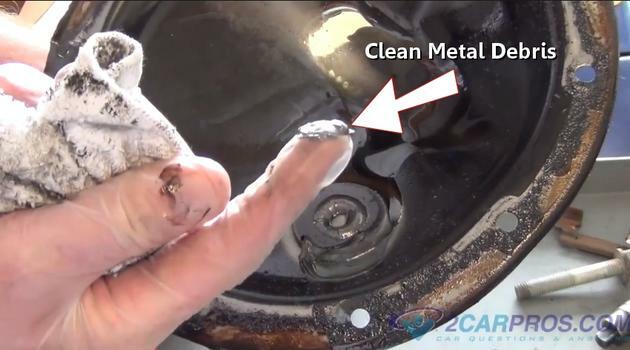 Next, clean the metal debris from the differential cover magnet and continue to clean the gasket surface with the scraper until free from gear oil. Use carburetor cleaner to ensure no oil is present. Then, install the new gasket using silicone rubber as a sealer. Create bead inside of the bolt holes to help control leaks. Do not use cheap home grade sealer, you need to get the good stuff which costs a little more but is available from Amazon, Home Depot or Lowes hardware stores. 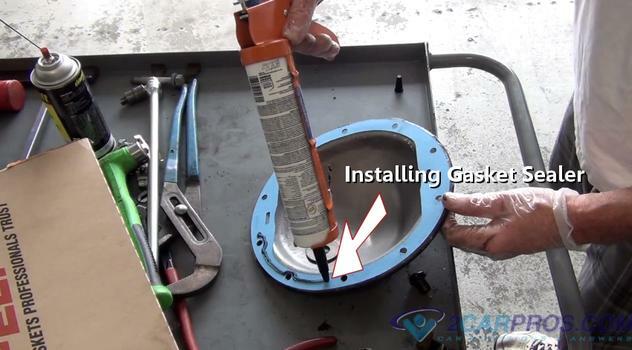 Carefully install the differential cover as not to disturb the gasket location on the cover. Excessive movement will cause the sealant to be less effective. Install the cover bolts and tighten in a star pattern. These bolts don't need be super tight, just snug. You should also revisit these bolts in a few days to give them an extra snug. We have received a lot of questions on how tight these bolts should be which is tough to say because the gasket likes to flatten in time but if you tighten them to manufactures specifications you can spilt the gasket so its best to do it in stages. Too tight will spilt the gasket while to loose will allow a leak, it's an art learned like anything else. 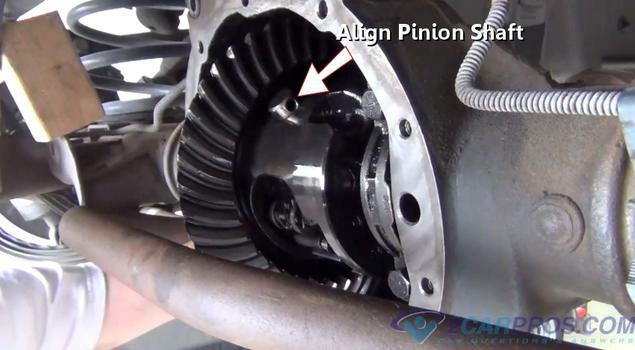 Once the cover bolts are tight, remove the differential fill plug which is located near the driveshaft this will be a 3/8 drive socket extension or ratchet head. 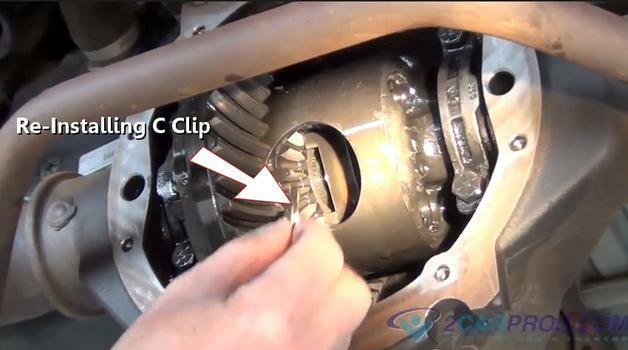 Then install the gear oil, if your vehicle has the clutch style (limited slip) unit you will need to pour in an additive which helps lubricate the clutches. Usually there will be a tag near the fill plug that indicates what kind of oil is required. 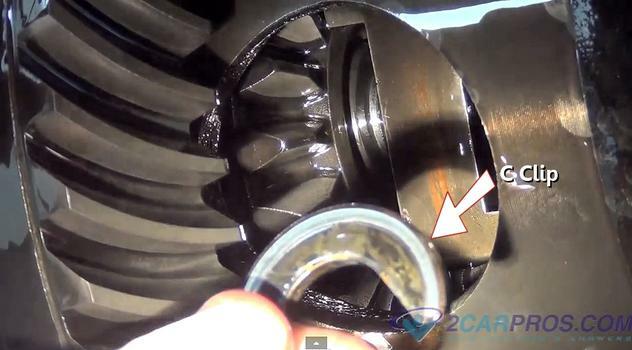 The fluid level is full when gear oil is dripping from the fill port. To double check the level gentle dip a finger inside the port. Never turn driveshaft or axles when checking gear oil to avoid injury from the pinion gear. Reinstall and tighten the fill plug and you are all set. Double check your work by looking for leaks at the cover. After reinstalling any brake parts and the wheel. Safely return the vehicle to ground level and take it for a test drive while listening for abnormal noises. Also, recheck the differential for fluid leakage. 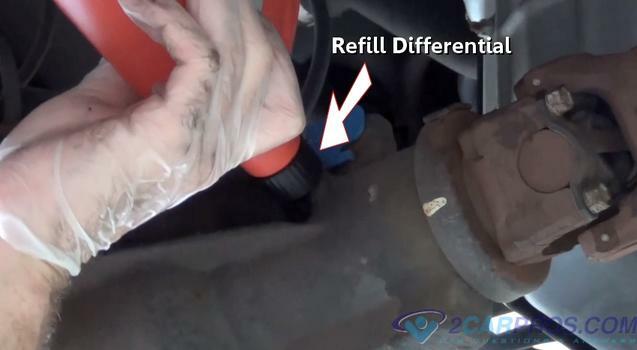 Its a good idea to tip the vehicle to the side the repair was performed to bath the new bearing in gear oil. To get an idea on what you are in for with this repair please watch the video below. 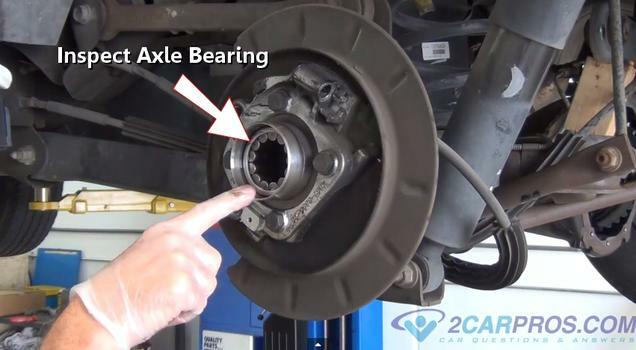 If you have any questions about an axle bearing or seal, please visit our forum. If you need car repair advice, please ask our community of mechanics who are happy to help. Our service is always 100% free.